Bella looks over Enzo’s Grave. Enzo passed away February 24, 2014. He is one of the first Species Spectrum greeting cards. Enzo helped create the best seller, “The real mountain is within you”. He will always be remembered as ‘We need more little dog in the hat”. We love you Enzo. This sweet photo shows the essence of pet loss. Bella, a one year old rescued German Shepherd looks over Enzo’s grave. 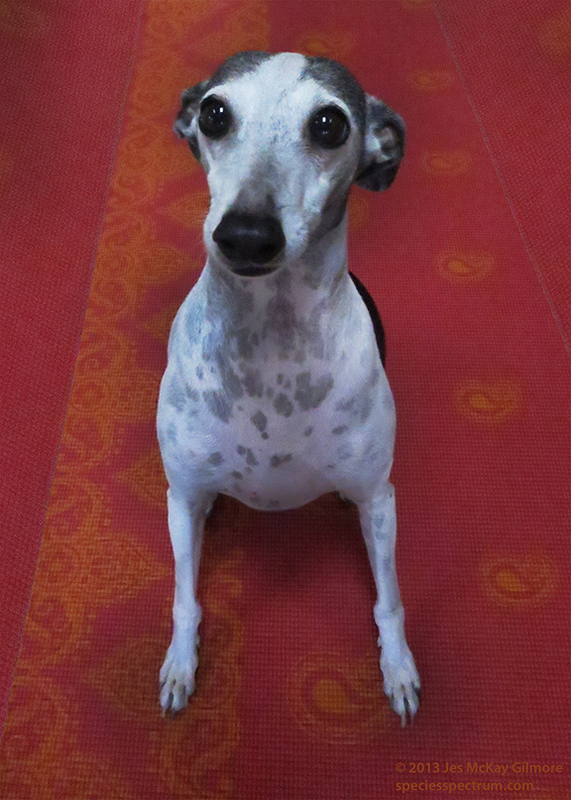 Bella was adopted just three months ago where she made friends with Enzo, an adopted Italian Greyhound. When we have beloved pets we are faced with one day losing them. We are never prepared for this. The grief of pet loss is often equated with the great pain of losing a human loved one (no offense to people). Our pets are family. Some of us will say the pain is too great and close the door to having another dog, cat or other pet. Grief comes in waves and we all cope differently. Most of us will go get another pet when it is right for us whether that is the next day or the next year. Many will say there is no dog like the dog no longer with us. This is true. No dog will ever be the dog you had before. It will be different, but it will also be great. I have gone through pet loss many times with my own pets, but also those of friends and people who’s pets I have come to love. Enzo was of of those pets. I’ve been photographing rescue animals and other people’s pets for a long time. Each one has a story and this is what Species Spectrum is about. Enzo was one of the very first greeting cards I designed and published. He is the basis for essentially the entire Species Spectrum greeting card line and the idea behind it: Showcase rescue animals in a positive way through a product people can share. Enzo has a great story. He was adopted through Greyhound Companions of New Mexico. 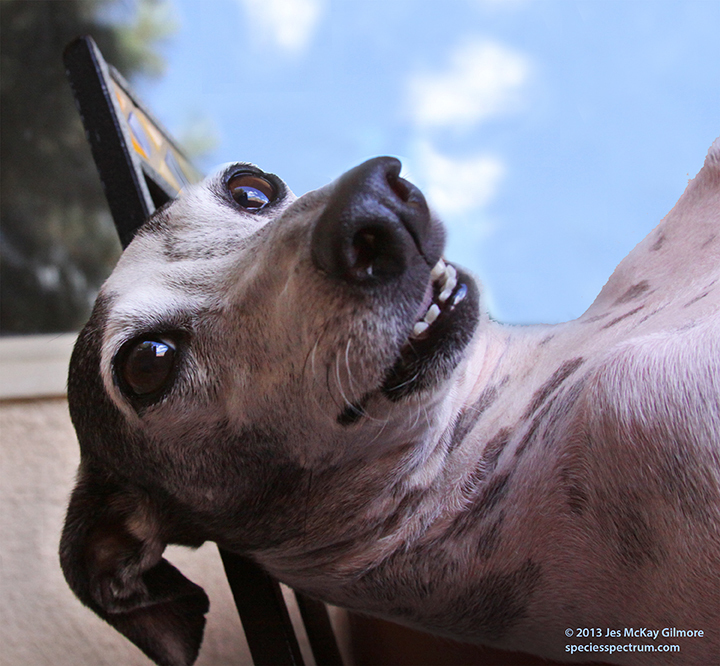 He was an Italian Greyhound who came from Roswell, NM. Enzo is an example of how many ‘pure bred’ dogs end up needing help in finding a permanent loving home. He definitely found that and spent the remaining six years of his life being treated like the prince of yoga. Enzo’s little spirit is missed, but his mission is bigger than the pain of losing him. I am sad he is gone, but at the same time I’m not sad. Here’s why: Enzo lived out his days as well loved dog and died peacefully at home in his fleece dog bed at the age of nearly twelve. Any dog (or pet) that has lived a long life being loved and cared for is lucky. Having worked in animal shelters, I know not every deserving animal is so lucky. This is why I hope that in honoring the loss of your own beloved pet, your grief is tempered by a greater compassion in helping the lives of animals that need someone’s help today. Enzo, you were one amazing little hound! R.I. P Enzo, you are always loved! I wish you lots of Golden Pride Chicken in your next life! Hear Enzo sing!